BIG has been keeping busy with more than designing mountainous green-roofed buildings and drafting comic books. They've also been laying out plans for a driverless world, where compact electric cars navigate on smart streets to reduce pollution and traffic while meeting the changing needs of our urban environment. In theory, computer-controlled cars could move more efficiently with less accidents to create a city that dynamically transforms and adapts to life between buildings. (Driver)Less is More is BIG’s entry in the Audi Urban Future Initiative — an international competition that challenges designers and architects to envision the world of tomorrow. BIG‘s proposal effectively alters our current urban transportation networks to create a pollutionless, noiseless, and driverless world. Applying the same rapid advancement in computer technology to the automobile industry, BIG figures that we are entirely capable of creating a highly-efficient urban transportation network by using compact electric vehicles and a smart street system. Computer-controlled vehicles have already been tested and proven to be effective; all that’s left is for us to move beyond the concept stages and develop the idea to its full potential. The cars would base their movements on sensor readings and swarm theory algorithms to determine the optimal path between any two points. 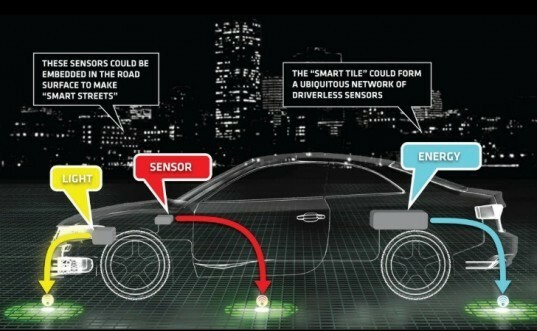 Smart streets built from solar-powered sensor tiles would help guide the cars around other cars, objects and pedestrians. This new transportation network would reduce the space necessary for cars driven at high speeds and create new public and pedestrian-friendly areas. Automobile fatalities and injuries from human error would be reduced, pollution would effectively be eliminated, and cities would be dramatically quieter. Bjarke Ingels and BIG will be presenting the project on May 7-9th during ‘THE FESTIVAL OF IDEAS FOR THE NEW CITY’ at the Openhouse Gallery, 201 Mulberry Street, New York, New York. 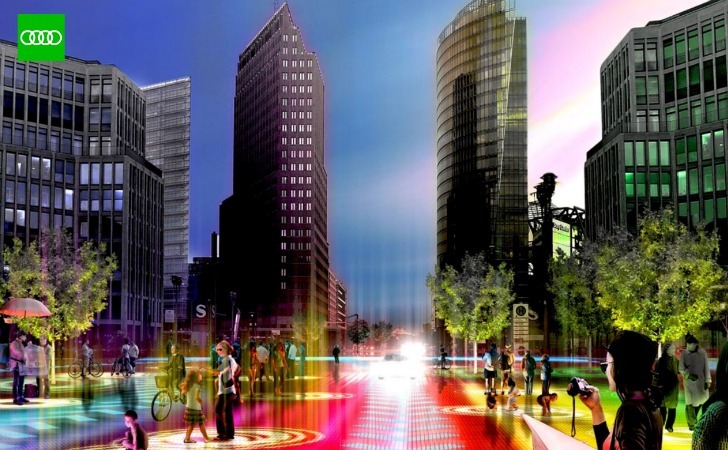 You can also hear more about it from Bjarke’s TEDTalk. I agree with Sy it'll make cities look awful. Multi-tiered cities have been tried in the seventies and have made for some miserable urbanism, with wind-swept, unsafe, artificial-feeling upper tiers (see La Defense and Cergy near Paris). This is a great concept, however I have some ideas I'd like to give to improve upon it. The road system between buildings needs to be multi-tiered to accommodate different kinds of traffic. One middle tier can be for these driverless personal transports. The lower tier can be for the heavy trucks. The top level can be strictly for pedestrians and bicyclists. The great thing about a tiered road system is that the lower tiers are protected from snow and other precipitation. In fact, pedestrians may insist on the solar cells being a covering for their tier rather than built into the road. In all cases it may be wiser to place the sensor grid in the ceiling rather than built into the road. I have yet to see a road that did not develop a pothole. (Driver)Less is More is BIG's entry in the Audi Urban Future Initiative -- an international competition that challenges designers and architects to envision the world of tomorrow. BIG's proposal effectively alters our current urban transportation networks to create a pollutionless, noiseless, and driverless world. Applying the same rapid advancement in computer technology to the automobile industry, BIG figures that we are entirely capable of creating a highly-efficient urban transportation network by using compact electric vehicles and a smart street system. Computer-controlled vehicles have already been tested and proven to be effective; all that's left is for us to move beyond the concept stages and develop the idea to its full potential. Pedestrian-oriented urban areas have small narrow streets with interconnecting nodes. Streets designed for house traffic are a little wider and set in a more formal grid network. Cities designed specifically with public transportation in mind enjoy more park space and pedestrian paths. Streets designed for the car require massive amounts of space for street infrastructure. BIG proposes that we take all that large infrastructure for streets and use it more efficiently. Computer-controlled cars require much less space to drive safely than human-controlled cars. Computer-controlled cars can navigate through tighter areas more efficiently than car drivers, thus eliminating traffic and congestion. The new transportation system of the future would also require smart infrastructure like GPS sensors and solar powered street tiles to guide the cars. Eventually, existing streets will become nebulous as cars can safely navigate around pedestrians and buildings.